Victoria, Mahe (Seychelles) – September 21, 2018 (travelindex.com) – The United Nations World Tourism Organisation (UNWTO) has this year said that World Tourism Day places focus on Innovation & Digital Transformation. They said that “The importance of digital technologies in tourism, providing opportunities for innovation and preparing the sector for the future of work, is at the centre of World Tourism Day 2018”. World Tourism Day, celebrated every 27th September around the world, is a unique opportunity to raise awareness on tourism’s actual and potential contribution to sustainable development. Seychelles has used World Tourism Day 2018 to launch a Tourism Festival and it should help echo the importance of tourism for the islands and for each and every Seychellois. Taking recognition of the importance of tourism, and understanding tourism is a constant challenge. This is why a moment of reflection during the World Tourism Day Celebrations to assess the successes and the challenges is also important. Today the tourism trade are using the Club Liberte Casino for their casual evening out amongst friends and colleagues and using it as their networking venue. World Tourism Day is also the opportunity for the Government to take stock of their key players. recognising the Seychellois in the industry is an important start to ensure that the public / private sector partnership continues with new vigour. 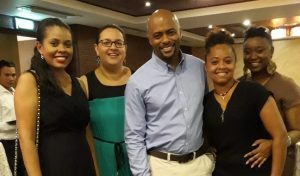 The Seychellois tourism entrepreneurs like Kathy Mason or Joe Albert, William Rose or Mary Geers, Robert Payet or Danny Loizeau, Christopher Gill or Jean Weeling or Sylvie Cardon amongst others are all partners of the country’s tourism industry and as such assets for the country. They lead the front line team n Seychelles and have the success barometer firmly in their hands. Staying connected and holding conducive dialogues with them all is a must and no longer an option. Minister Maurice Loustau-Lalanne presents a Certificate of Appreciation. In 2017, during the Seychelles Tourism Board’s annual Tourism Ball organised as part of Tourism Week and in the presence of representatives from various sectors of the Seychelles tourism industry the then Minister for Tourism, Civil Aviation, Port and Marine, Ambassador Maurice Loustau-Lalanne said there is much to ponder upon as the country looks set to achieve a new record in terms of visitor arrivals and its corresponding expenditure. He noted that this is indeed testament of the hard work by all actors in the industry to ensure that the product and services are everything that they can be in this very competitive arena. “I salute you because without your commitment we would not be talking about records and we at the Ministry and the Seychelles Tourism Board look forward to another year of working together and contributing towards the continued success of the industry,” said Minister Loustau-Lalanne. It was during that ceremony that Minister Loustau-Lalanne presented me with a certificate of recognition for the contribution made while leading this primary sector of the economy as Minister responsible for Tourism, Civil Aviation, Ports and Marine and also for my continued contribution towards the betterment of this industry. At the same ceremony that the names of Sir James Mancham, the founding President of Seychelles and first Minister of Tourism, Louis D’Offay, the long time Chairman of the Tourism Industry Association, Maryse Eichler and Zita Monthy were also added to the tourism pioneers list alongside the 2017 additions namely Adrien Michel, John de Matta Mascarenhas, Richard Mancham and Raymonde Delorie. In a recent press point, the Minister for Tourism, Civil Aviation, Ports and Marine, Didier Dogley has unveiled the program of activities marking the annual tourism week in Seychelles. The annual Tourism Week in Seychelles is an extension of the annual World Tourism Day celebrated on September 27 and initiated by the World Tourism Organization (UNWTO). This year’s celebration comes earlier on the calendar; the festivities will be launched in an official ceremony at the Savoy Seychelles Resort & Spa on September 15 and will last until September 22. The organizing committee under the leadership of the Minister for Tourism, Civil Aviation, Ports and Marine, Didier Dogley, constituted of the Tourism related agencies including the Seychelles Tourism Academy (STA), Seychelles Civil Aviation Authority (SCAA), Seychelles Hotel Tourism Association (SHTA), the Seychelles Tourism Board (STB) alongside the private sector, all working together to revamp the event. Minister Dogley explained that objective of this year’s organising committee is to revamp the event by elevating the event’s profile. “This year’s event is very important to me; it will be my first participation in this key event. I believe that it is important while we celebrate the tourism industry and its achievement; we also raise awareness about its importance for the country,“ Said Minister Dogley. As part of giving another dimension to the event, the department has decided to emphasis on the participation of local public and visitors alike. The thinking behind engaging the public is to raise awareness about the importance of the tourism industry to the local economy, the festival will be carried under the umbrella of the Seychelles Hotel Tourism Association (SHTA) campaign launched in 2017, “We are Tourism”. Talking about the activities the Principal Secretary for Tourism Mrs. Anne Lafortune, explained that the tourism festival would bring to the public a plethora of activities merging education, information and pleasure to the calendar of events. Minister Dogley expressed his satisfaction to have succeeded in getting the support of various partners for the various activities. “We depend on tourism and we need to take care of it. The tourism festival is not only about the serious elements of tourism but also about having our stakeholders having fun. It is going to be an exciting experience for the local tourism industry,“ said Minister Dogley. For this year’s edition, the committee’s effort has focused on service and standards besides raising awareness on the value and contribution of the Tourism as the main pillar of our economy. Minister Didier Dogley, the Seychelles Minister responsible for Tourism, Civil Aviation, Ports and Marine launched the 1st. Edition of the Tourism Festival 2018 at Beau Vallon accompanied by his PS for Tourism Anne Lafortune. The week long Festival will also see a Waiters Race, a Food Fiesta on both Praslin and La Digue islands as well as the annual Tourism Ball of Saturday the 22nd September.